There are lots of gadgets you can buy to simulate a blocker, but if you’re on a tight budget, you might try what Pacific Ridge High in Carlsbad, California does. First, put up 2 antennas a couple of feet apart where the right-side blocker would be. Then, build your "blocker" out of the kind of plastic wrap used to ice a player’s shoulder. Check the video for details. 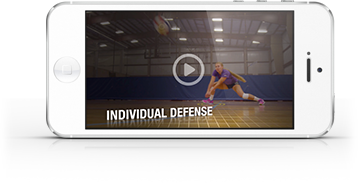 The drill itself is designed to teach hitters to attack line or crosscourt, not hit right into the blocker. To start the drill, have a group of the hitter-passers line up at the service line and put a setter at the net. A coach will initiate play by tossing balls over the net to a passer-hitter, who passes, then swings out wide, makes an approach and hits a ball from the setter. After that first attack, the hitter quickly sprints back off the net to get ready to hit another set. The pass for the second set is delivered by the next passer-hitter in line, who then makes the same progression as the first hitter. Attackers getting off the net and taking a wide approach. Hitting hard cross court if the set is dying inside and line if it’s outside. Using the arms to generate extra height on the attack jump.